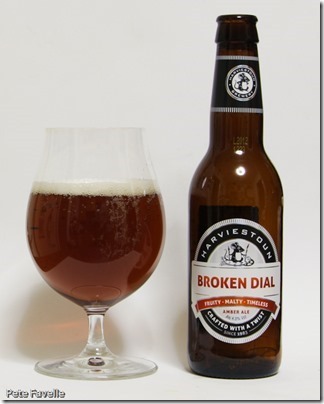 After being so deeply impressed by The Ridge, I’m eager to see what the second new beer from the folks at Harviestoun is like. The big question is, can lightning strike twice? Happily, the answer is an emphatic “yes”. Broken Dial is a “super-hoppy” 4.5% ABV ale with an odd name. It’s a deep amber colour, with a fairly thin, fine textured white head on top. The nose is heavy with floral hops and raw sugarcane – the passionfruit and mango tones sailing dangerously close to smelling of 5 Alive. The flavours are initially rich, with apricot fruit and light toffee on the tongue. A deep, oily bitterness quickly asserts itself, with more orange pith than hops, and is soon joined with sweet orange blossom notes. The bitterness doesn’t linger over-long, however, and the finish is more dry than bitter. When I first tried it, I preferred Broken Dial to The Ridge but over time I’ve come to see them the other way around. Although wonderfully delicious, I find the oily bitterness just a touch jarring – still, a much deserved 4 stars.